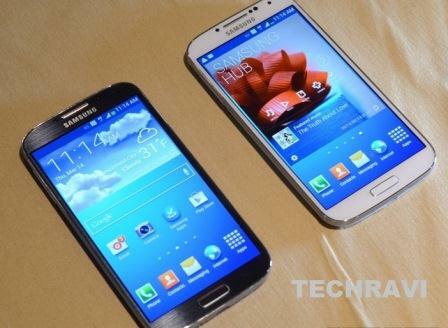 Samsung finally revealed his most awaiting flagship Galaxy S handset model – the Galaxy S4 to the public. It comes with many new amazing specs like 4.99-inch Super-AMOLED display with Full HD (1920*1080) resolution with 'Adapt Display' technology which automatically adjust the brightness, contrast, saturation of the display as per the content played on the screen. It is the next generation device , many new advance features than Galaxy S3. It is slightly bigger , much lighter and more stronger than its predecessor. Internally, it is powered by Samsung’s own Exynos 5 Octa SoC (4+4 cores) with massive 2GB of RAM, It offers 16/32/64GB of internal storage along with a microSD card slot. For connectivity side, the Galaxy S4 is loaded with NFC, GPS with A-GPS, Wi-Fi b/g/n/ac, IR blaster, LTE, MHL 2.0, Bluetooth 4.0+LE. It also includes a temperature/humidity sensor and IR sensor. To power these exciting features , this phone is packed with a 2600mAh removable battery which supports it for a whole day depends upon medium to heavy usage. The main camera on the back is a 13MP f/2.2 with LED flash and a 2MP camera in the front.The Galaxy S4 will be running on Android 4.2.2 (Jelly Bean)with the second generation of Samsung’s TouchWIZ UI launcher. The handset will be available in two colors – Black frost and White mist. The Galaxy S4 will be available from the end of April across 327 mobile operators in 127 countries.